Soldier's Letter, 3 1/2 pages, approx. 7 1/2" X 12", Camp near Atlanta, Ga., Wednesday, Aug. 17th, 1864. 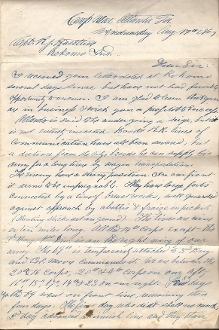 Jacob S. Pierson (Co. C, 69th Ohio Infantry, killed 9/1/64 at Jonesboro, GA) writes informative, lengthy letter to Capt. Haseltine pertaining to Atlanta campaign action. "...Atlanta is said to be under going a siege, but it is not entirely invested. Hood's R.R. lines of communication have all been severed, but a distance from the city, besides he can supply his army for a long time by wagon transportation. The enemy have a strong position. In our front it seems to be impregnable. They have large forts connected by a line of breastworks, well guarded against approach by abbatis & fraize or picket (slanting sticks set in ground). The lines are nine or ten miles long. All the 14th Corps except the 3d Brig. 1st Div. is on the right wing of our army. The 69th is temporarily attached to 3d Brig. and Col. Moore commands it. We are between the 20 & 16 Corps, 20th 24th Corps on our left, 16th, 15th, 17th, 14th & 23 on our right. Few days ago the 69 went on front line, remaining there four days. The first day rebs didn't shell us much. 2d day advanced skirmish line and they then learned that we had a line of battle where they had thought was only the reserve of our pickets. And they did shell us for God sake making it any thing but agreeable. During the day 69 lost four men, Medlem Co. D gunshot wound in arm not dangerous, on picket Srgt. Arnold, "E" Act. Srgt. Maj. arm by piece of shell, severe, amputation most probably be necessary - Combs Co. B mortal in side by shell (has died). D.B.Thompson (Duck) Co. C slightly in back piece of shell. On 3d day our batters were in position and after a hard duel lasting several hours the enemy was almost silenced, during the morning a piece of shell raked through my tent missing my head about one inch. I was writing a letter, the sun was getting hot and I stept out spread my blanket over side of tent and resumed my seat at desk and leaning a little forward just finished one letter - of the word places, had I not commenced the word and been sitting upright, it would struck me about the ear. Doc Stevenson was struck same day on head with piece of shell, inflicting a slight wound. One piece of shell passed through 5 tents in the regiment passing from F to C down hill, had about the same decent that the missile had and kept about same distance from the ground, luckily the men were mostly in the works, had they been in their tents several would have been struck. The last heavy fight the 69 was in was on the 21st last month day after rebs charged 20th & part of 17 & 14 Corps. Reached the front of 1st Brig of our Div. We, 3d Brig was under a heavy cannonading, but an open field ran in our immediate front and rebs did't cross it. During the night the enemie's right wing fell back but on left of our Brig. was closely confronted and we had to advance. Part of the Brig. passed round to left of the field and part right, however the 69 in front line had to cross the corner, but in crossing a fence the boys scattered, and went a large portion of the distance indian fashion, but rallied at a ravine under a heavy fire and rushed on to the Jonnies precepitally taking 42 prisoners losing 1 killed & 12 wounded. Robert Ireland poor thing kept up bully. D. Longfelllow says Robert kept right at his heals and that he (Dan) never run faster in his life, and can't account for how Robert kept up with him. Co. C lost none that day. I don't know whether you are acquainted with particulars of casualties in Co. C clear through. I will recite it.
" Mercer " near Dallis 31 " "
" L. P. Broderick wounded " " " "
D. Ross wounded Resaca 14 May "64 and died July 19 at Nashville. J. H. Lupl wounded Resaca May 14, now at Murfreesboro nearly well. Eye same place time wounded, now at Nashville doing well. J. Jordan same place & time wounded is now home on furlough. He will never be able for service in field as a part of the bone of his arm was taken out. The lick that Thompson got knocked him down and causing cessation of respiration for a short time, but will not keep him from duty but a few days. There has not been much fighting lately here. Picket firing and cannonading is the daily program. Rumors indicate something more lively to take place before long. Wheeler is in our rear, has done some damage, but latest account says that he has been badly cut up. Gen. Stoneman is captured with several hundred of his men. The balance of Co. C are all right. Dark blue ink, some fold splits & aging, otherwise fine.